Download "UNITED STATES SECURITIES AND EXCHANGE COMMISSION Washington D.C. 20549 CURRENT REPORT"
3 Exhibit 3.5 STATE OF DELAWARE SECOND CERTIFICATE OF CORRECTION Wizard World, Inc., a corporation organized and existing under and by virtue of the General Corporation Law of the State of Delaware ( DGCL ), does hereby certify: 1. The name of the corporation is Wizard World, Inc. (the Corporation ). 2. 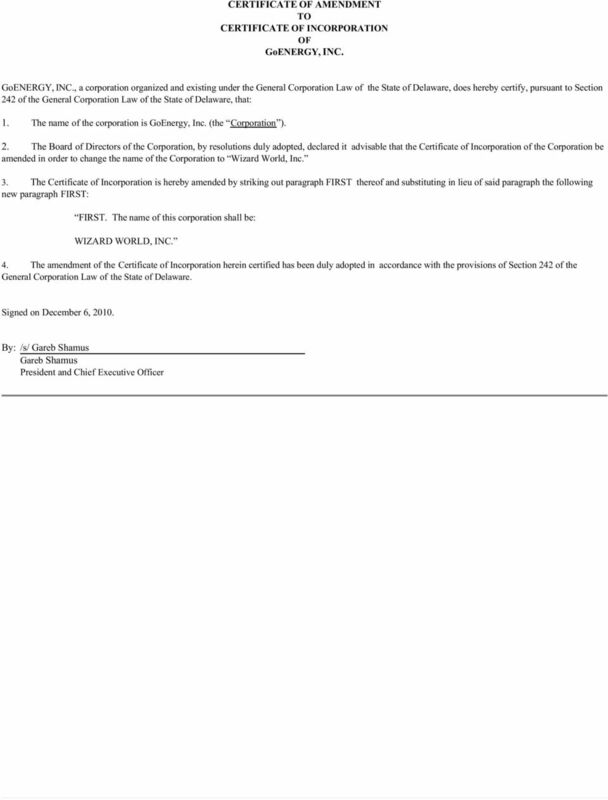 That a Certificate of Amendment to the Certificate of Incorporation of the Corporation was filed with the Secretary of State of the State of Delaware ( Delaware Secretary of State ) on December 6, 2010 to change the name of the Corporation from GoEnergy, Inc. to Wizard World, Inc. 3. 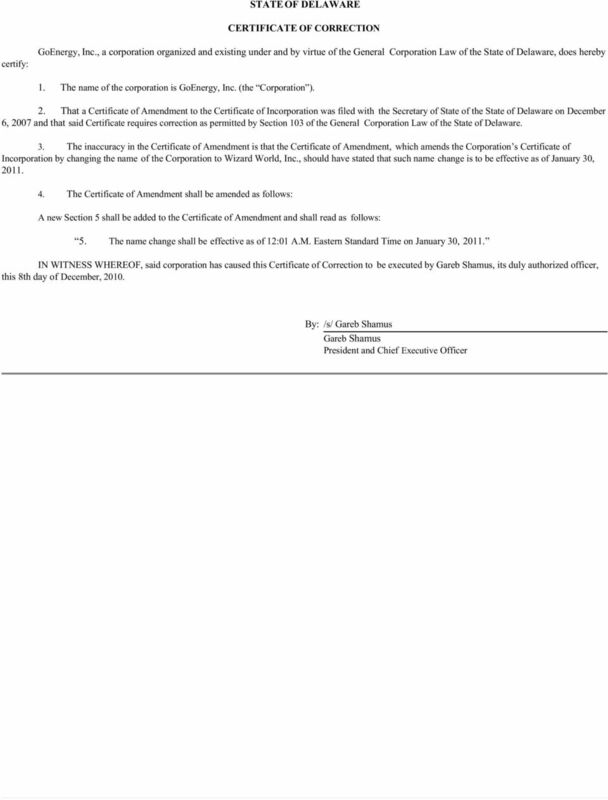 That a Certificate of Correction was filed with respect to the Certificate of Amendment with the Delaware Secretary of State on December 8, 2010 (the First Certificate of Correction ), as permitted by Section 103 of the DGCL, to make the effective date of the name change January 30, That the Corporation desires to accelerate the effective date of the name change, as permitted by Section 103 of the DGCL, by filing this Second Certificate of Correction. 4. The Certificate of Amendment shall be amended as follows: Section 5 shall be deleted in its entirety. IN WITNESS WHEREOF, said corporation has caused this Second Certificate of Correction to be executed by, its duly authorized officer, this 20th day of January, 2011. 4 STATE OF DELAWARE CERTIFICATE OF CORRECTION certify: GoEnergy, Inc., a corporation organized and existing under and by virtue of the General Corporation Law of the State of Delaware, does hereby 1. The name of the corporation is GoEnergy, Inc. (the Corporation ). 2. That a Certificate of Amendment to the Certificate of Incorporation was filed with the Secretary of State of the State of Delaware on December 6, 2007 and that said Certificate requires correction as permitted by Section 103 of the General Corporation Law of the State of Delaware. 3. 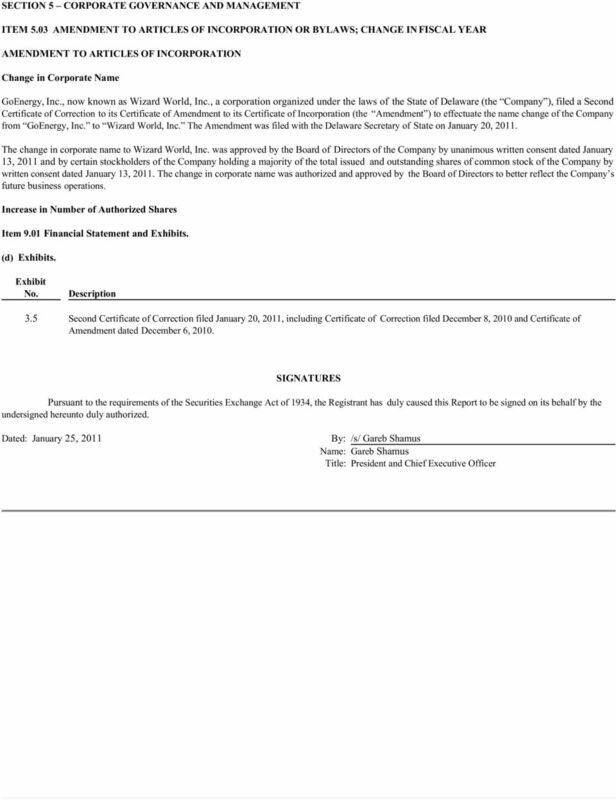 The inaccuracy in the Certificate of Amendment is that the Certificate of Amendment, which amends the Corporation s Certificate of Incorporation by changing the name of the Corporation to Wizard World, Inc., should have stated that such name change is to be effective as of January 30, The Certificate of Amendment shall be amended as follows: A new Section 5 shall be added to the Certificate of Amendment and shall read as follows: 5. The name change shall be effective as of 12:01 A.M. Eastern Standard Time on January 30, IN WITNESS WHEREOF, said corporation has caused this Certificate of Correction to be executed by, its duly authorized officer, this 8th day of December, 2010. 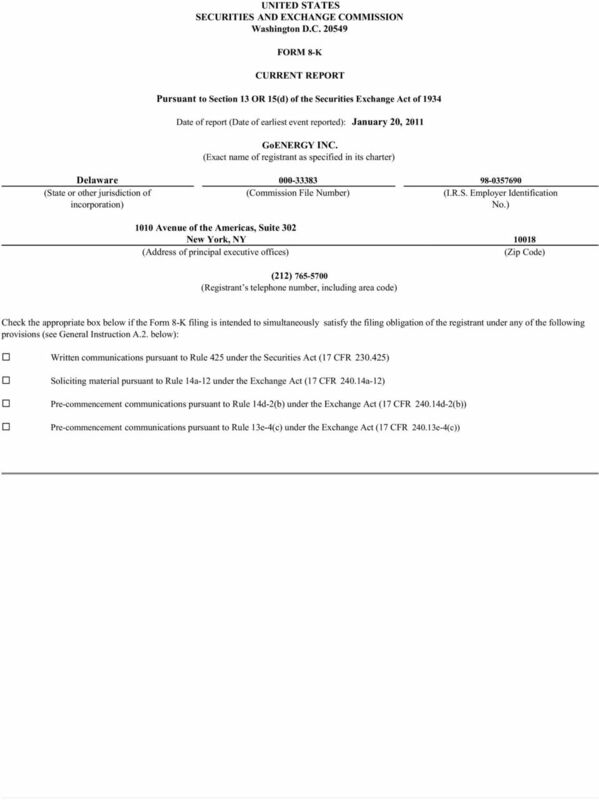 5 CERTIFICATE OF AMENDMENT TO CERTIFICATE OF INCORPORATION OF GoENERGY, INC. GoENERGY, INC., a corporation organized and existing under the General Corporation Law of the State of Delaware, does hereby certify, pursuant to Section 242 of the General Corporation Law of the State of Delaware, that: 1. The name of the corporation is GoEnergy, Inc. (the Corporation ). 2. 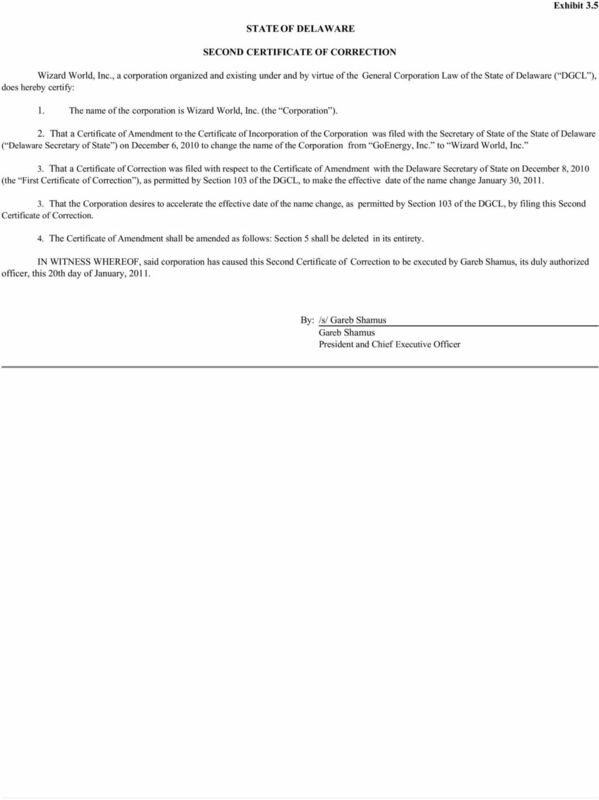 The Board of Directors of the Corporation, by resolutions duly adopted, declared it advisable that the Certificate of Incorporation of the Corporation be amended in order to change the name of the Corporation to Wizard World, Inc. 3. The Certificate of Incorporation is hereby amended by striking out paragraph FIRST thereof and substituting in lieu of said paragraph the following new paragraph FIRST: FIRST. The name of this corporation shall be: WIZARD WORLD, INC. 4. The amendment of the Certificate of Incorporation herein certified has been duly adopted in accordance with the provisions of Section 242 of the General Corporation Law of the State of Delaware. Signed on December 6, 2010.